Would a whale take on the most dangerous predator in the ocean to help another animal – sometimes even an animal of a different species? 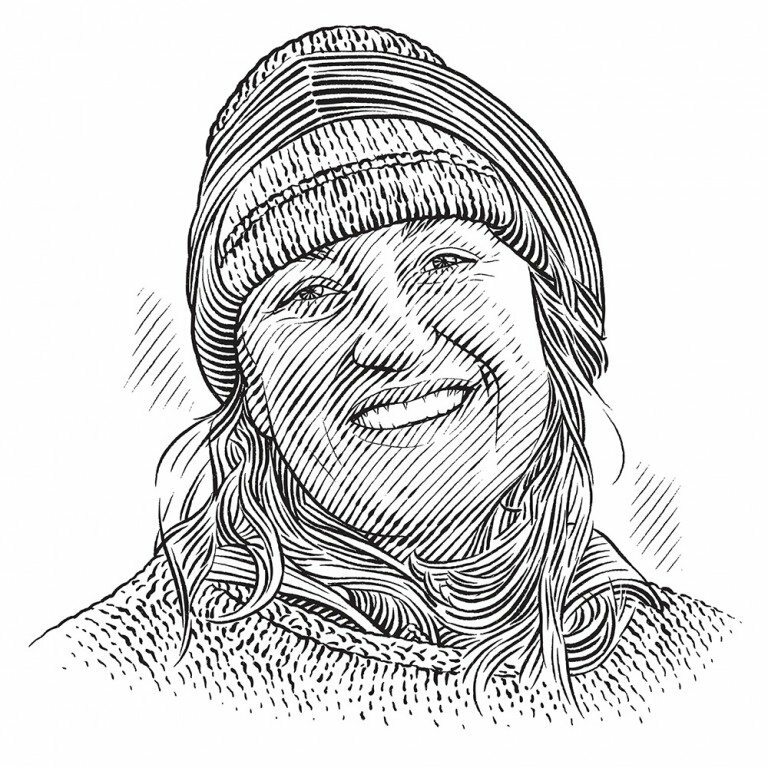 Janie Wray discusses whether humpbacks could be doing just that. My emotions were intense when I first witnessed a pod of transient orcas chasing a group of sea lions. When you add to this encounter two humpback whales that, from my perspective, had charged in to protect their marine companions, my mood changed entirely. I was torn, especially when the tables turned and suddenly one of the humpbacks had become the orcas’ new target. This did not last long, though, as the other, larger humpback suddenly flanked the younger whale. Its one-ton pectoral fin with razor-sharp barnacles and its massive tail flukes slammed the water and the transients, deterred, were soon on their way. Stories like this are becoming more common around the world, causing people to wonder about interspecific relationships and the altruistic behaviour of humpback whales. Transient orcas prey on marine mammals, and a study that reviewed 115 interactions between them and humpback whales has recently been published. The results are both extraordinary and tantalising, leaving room for further exploration. Very few records exist of transient orcas hunting humpback whales. They are known to target smaller cetaceans and marine mammals such as porpoises, dolphins, seals and sea lions. It is possible that in pre-whaling times, when the abundance of humpbacks was much higher, transient orcas may have preyed on these whales without our knowing about it. Now, as the population of humpbacks continues to increase, we may be witnessing the return of a once-lost behaviour. Among the humpback calves returning to northern feeding grounds after their long migration from the south, we have noticed a definite increase in the number of them that have obvious rake marks from orca teeth on their tail flukes and pectoral fins. In 2013 we observed a female humpback with her new calf, a male, and were stunned to see the large number of rake marks all over the young whale. It was surprising that he had even survived. We could also see recent rake marks on the mother’s fluke. We imagined she must have put up quite a battle to protect her little one. We named the calf ‘Champ’ as he had clearly survived a life-threatening encounter. We also noticed that he loved to breach all the time and decided that he was probably practising this manoeuvre in case of another attack. This type of experience at a young age could certainly explain why an adult or sub-adult humpback might charge in to protect its own kind from a group of transient orcas. Interestingly, though, on 85% of the occasions when humpbacks respond to an attack by transients, they defend species other than their own. These interactions most certainly come at some cost for the humpback and appear to be maladaptive, since they too are a target for transients. So why do they behave in this way? It is possible that the behaviour is a territorial response on the part of these whales. The humpbacks we have catalogued demonstrate strong site fidelity, so much so that we refer to most of them by name. We have observed social bonds between members of this population that extend well over a decade, as well as mothers that have brought their third or fourth calves to these waters. 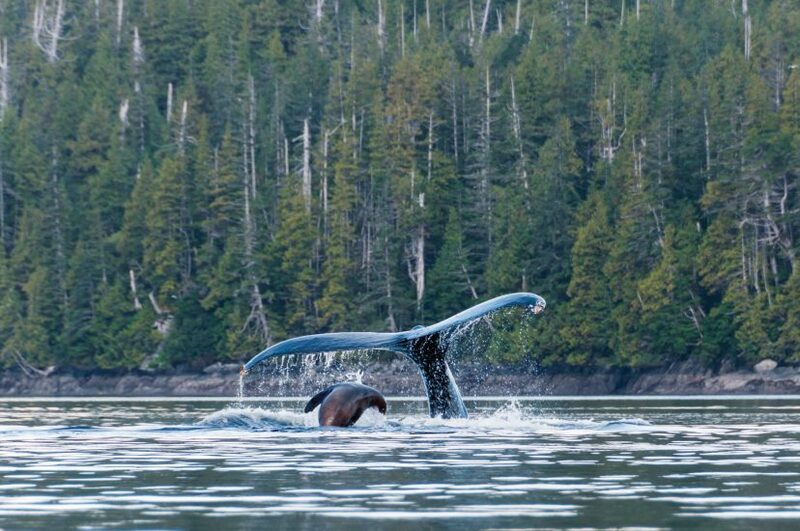 This population has grown from 42 to more than 400 and relies on the pristine waters around the Great Bear Rainforest as its summer feeding ground. As in many species that maintain the same habitat range year after year, an instinct to charge at a known predator may have evolved. Humpbacks may respond to the distinctive calls of transient orcas without knowing what species is at risk during the hunt. Once they arrive, the act of chasing the transients away could still benefit the humpback population, even if they are not defending one of their own kind or if the kill has already occurred. 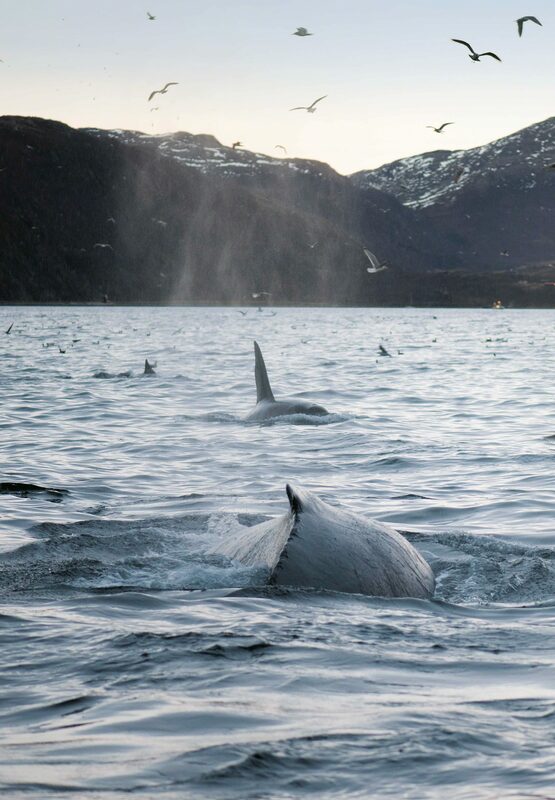 If this behaviour is repeated throughout the season, hindering the transient orcas’ ability to feed, chances are that the predators would travel elsewhere to forage. As a result, there would be certain safe areas in which young humpback whales are able to live without the constant fear of an attack by transients. This does not preclude the idea that we are witnessing altruistic behaviour in humpback whales. The first time we recognised that marine companionship was developing between humpbacks and sea lions was in 2006. In the late fall of that year we were fortunate enough to witness a massive return of pilchards (sardines) to our research area. In a harbour close to the lab we observed more than 200 sea lions and up to 15 humpback whales, all involved in a gleeful feeding frenzy. They were spread out in groups and in each one there were one or two humpbacks with 10–15 sea lions. The feeding technique employed by the humpbacks brought many pilchards to the surface and the sea lions took full advantage of the glut. The humpbacks were not bothered by the crowd of sea lions waiting at the surface after every feed. We sat back and watched as the relationship developed, and although recently we have not seen this interaction repeated to such a high degree, we are witnessing the results of a door having been opened between the two species. Groups of sea lions often seek out juvenile humpbacks, although they appear to prefer mother-and-calf groups. The mother does not seem to mind as her calf twists and turns within a play group of young sea lions. Perhaps for her this is a break, a time to relax while her calf is entertained by the energetic antics of its travelling companions. I have often wondered whether encounters like these between species, when both are so young, have encouraged the altruistic behaviour of humpbacks that is now seen along the coast. 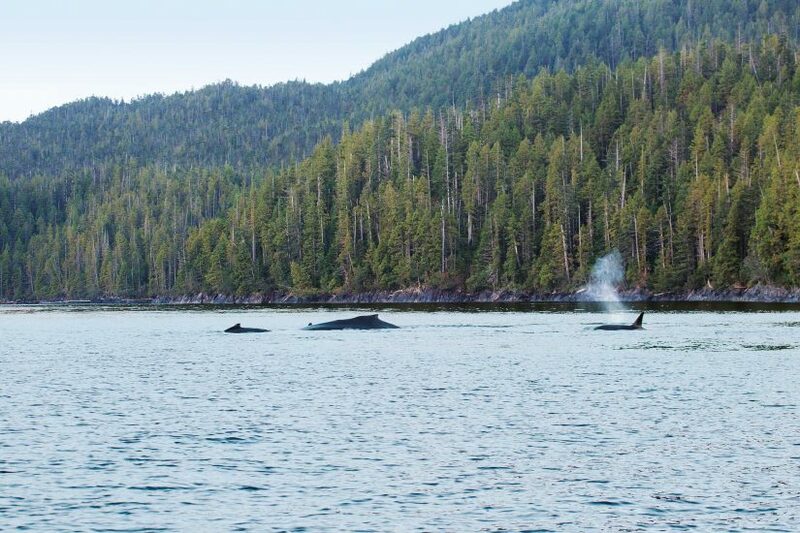 Another example of cetacean companionship – between resident orcas and fin whales – is developing along the north coast of British Columbia, and at first glance it is quite alarming. There are two types of orca that frequent this area: transients that hunt marine mammals, and residents that feed primarily on salmon. Marine mammals that make up the prey species of the transients recognise the difference between the two types and know they need fear only the transient orcas. But how do they distinguish between them? Probably underwater. Resident orcas, unlike transients, are extremely vocal and their calls are quite distinctive. And, just like the humpback whales, resident orcas will charge or chase transients out of an area. 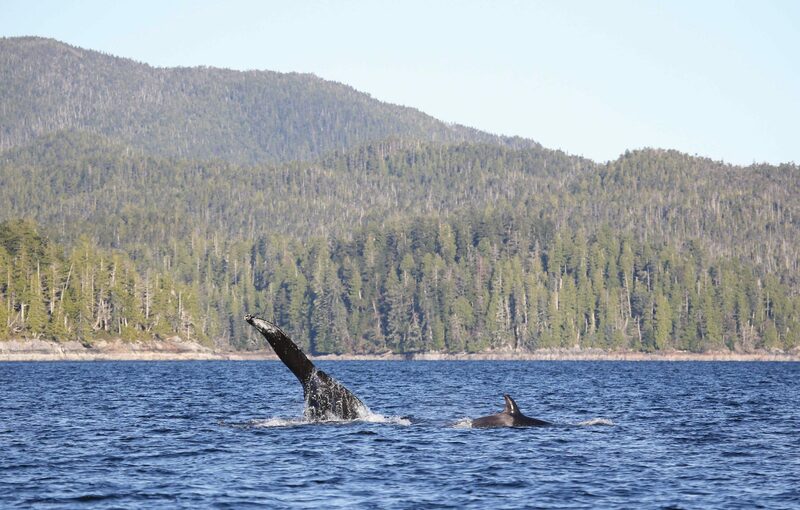 So it should not have been so surprising the first time we saw a young fin whale swimming with a pod of resident orcas. There could be no safer place for this large whale than within this group of guardians. There has never been a documented case of transient orcas attacking residents – only the other way around! When we brought up the subject of interactions between humpbacks and transient orcas with Paul and Helena, who have been managing OrcaLab on the south coast of British Columbia for more than 35 years, the conversation became extremely animated. They encounter a larger population of transients and a smaller population of humpbacks in their research area than we do. Yet the number of incidents of humpbacks putting themselves between sea lions and a group of hunting orcas is even higher than the number we have observed along the north coast. There is no doubt that a significant relationship is developing between these species. Although researchers around the world may have differing opinions about what is occurring, we can agree that there is still so much we do not yet understand.